Ready to hit the road? Road trips with toddlers can be stressful. However, a few helpful items can be instrumental in making happy vacation memories! Make sure you have these travel essentials to make your family trip safe, fun, and trouble-free. This is in addition to the obvious carry-on must haves you should bring like diapers and milk. Most of the kid items here are intended for 2 years and older. If you have a younger child in tow, please adjust accordingly. If you’re looking for gift ideas for the little traveler, read our recommendations here. From headaches, allergic reaction to new food or even boo-boo’s or ouchies from exploring, I’m a traveling pharmacy. I’m not a fan of stopping at pharmacies or stores in unfamiliar towns or countries. So, I always pack these over-the-counter (OTC) remedies. Also, do not take this as medical advice. Always consult your doctor or your pediatrician especially if you have infants with you. Let’s say we were not able to prevent this from happening. You’d be happy to have the Carebag Vomit Bag with you when that happens. It has an absorbent pad at the bottom and it also deodorizes. Bring extra clothes for yourself and the children too! While the cardinal rule is to ALWAYS wash your hands, sometimes, you’re stuck in a situation where there is no accessible sink or soap. 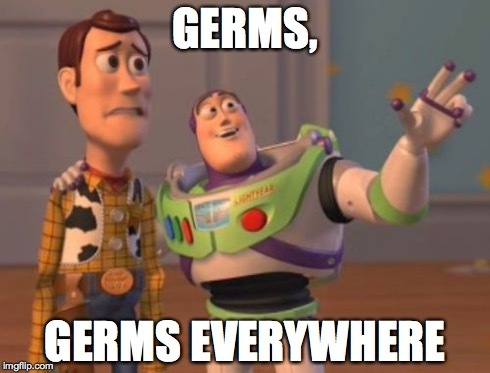 That’s when a reliable alternative comes to place–the good ol’ hand sanitizer. A great example is Purell’s Travel Sanitizer bottles. It’s easy to carry on your person and it even has aloe, which helps to keep your hands moisturized. It smells nice too! It doesn’t leave a sticky residue in your hands. And if that doesn’t appeal to you, there is also Purell’s Sanitizing Hand Wipes that comes individually wrapped. The only downside is having to dispose of them after every use. Remember, nothing beats hand washing. Potty on the go for the toddler that has to go! When you got to go, you have to go. When you have little ones, especially those that are still potty training, chances are, they can’t hold it in until the next stop. Thankfully, there’s OXO Tot 2-in-1 Go Potty for Travel . It can both be used at home or when you’re on the go–may it be road trips, flights or trips to the mall. This folds up nicely and comes with a travel bag. It can be easily put away in your diaper bag. Some toddlers might be uncomfortable sitting on plastic bag that intends to wrapped over the seat (you can buy refills) but you can easily secure them underneath the seat instead of on it. If you don’t like to take any of the above mentioned, you can bring some disinfecting wipes or a to-go Lysol disinfectant spray. Electronic devices can help keep your little children from being antsy. I know, I know. But those gadgets keeps everyone sane when waiting for that connecting flight in the airport. Just check on them often and make sure you’re still communicating with your kids and family. Try to play the games or watch movies with them. We use an old iPad model for our son and just bought a kid-proof case like Pepkoo’s or HDE’s for it. If you want something not too pricy or don’t have an old iPad, there is also the 8GB Amazon Fire or 16GB Amazon Fire. It comes with apps as well and is WIFI-enabled. It’s a lot of tablet for its price! Otherwise, you can use something like a kid activity tray like this one to keep them occupied. Don’t forget to pack their favorite snacks! You can make or take your own and stick them in zip lock bags. When our son was younger, we were very happy with the Gerber Graduates line of snacks. There were canisters of corn snacks and puffs. I remember even tasting them before and they taste good! Another portable snack I like are those squeezable apple sauce packs or yogurt packs. Kids also love gummy bears. A good alternative is Mott’s Fruit Snack Medley. While you are at it, you might want to read the Top 5 Meals For Travelling With Picky Eaters. You have to consider if it’s practical when traveling abroad. Some countries don’t require a car seat in cars. We don’t intend bring one when we fly. It just goes against traveling lightly. It’s inconvenient for us to deal with possible damage or lost and even carrying it around. We would rather rent a car with one or buy a cheaper one in our destination. If you have a travel credit card, this expense counts towards your travel rewards. Avis and Enterprise offer the cheapest price of car seat rental. Hertz offer free car seat if you’re an AAA member. SilverCar also offers free car seat to its customers and their fleet is all Audi. One advantage of having a stroller with you is that it can function as a cart for your diaper bag and your other bags. You need to buy one with a ample basket space. For quick weekend getaways, we have an umbrella stroller like the Cosco Umbrella Stroller, which we bought from Target. We have the diaper bag hanging on the handles. It folds up really well. Things I don’t like about it are: doesn’t recline, canopy is not enough to cover him from the sun (but you can always buy a good rain and shine canopy cover for that), doesn’t have cargo space at the bottom. However, it’s a good compact stroller for quick strolls. There are a lot of choices for strollers. I strongly recommend traveling with the smallest one you can. For our Disney trip, we bought the Kolcraft Cloud Plus Lightweight Stroller. We like how it’s lighter than our Graco stroller but still reclines for those naps. It also has a lot of room in its basket. Traveling with kids does make vacation planning much interesting. However, we stick to the original plan of having fun with the family. I shared my go-to list for traveling with kids. Did I miss anything? What are your must-brings when traveling with kids that you would like to share? Please share in the comment section below. Are you looking into camping with your family? Read this awesome guide on camping with the kids and toddlers. Great list! I also bring diaper wipes on every vacation (even though we are way past the diaper stage with our children). It’s super useful for spills and sticky hands. Also, we always bring bug spray and sunscreen. This was a very informative post! My daughter is one now and most of the items listed on here I did not even think of bringing while traveling with her! Next time I will be more prepared! Great list! Also remember to get a car seat travel bag to protect your seat if you choose to bring your from home. Thank you! That’s a good suggestion. Traveling with little ones is a major undertaking! You hit the major points of: keep them fed, keep them entertained, keep the potty close by, keep the germs under control, and think ahead to all the steps of travel you’ll have to go through! Great tips for parents making a first big voyage! This is so perfect timing as I’m literally packing tonight for a vacation with my husband and son. Thanks for sharing!! Glad to be of help! ? Where are you guys heading? Snacks – 100% a necessity, lol! Everything else super helpful – like the idea of a sick kit. I’m a fan of those! Better than a grocery bag that may have tears! I really like this list. Good points esp about the safety goods. I would also add insect repellents to that list. We go often to india and it is a must have!